Make you you have a backup, if you can make a backup offsite or on a portable unit now is the time and make sure is up to date. Shutdown the operating system and power off the computer. Disconnect the power from the UPS or from the wall. If you can disconnect all the cables from the back of the computer instead that will be a better idea because you will be disconnecting the network cable which somehow have access to the outside work and it can conduct electricity in case of a lighting strike. Move the tower to a higher ground maybe on top of your desk will be a good spot. Cover the computer with trash bags and make sure there is no opening where the water can coming. Even if your building don’t have windows the ceiling can leak water down. Disconnect the power cord and the network cord from the back of the printer. Make sure you plan with your staff when to leave the office and disconnect the network. DO NOT wait until the storm is ready to hit to send the staff home, you will always forget to disconnect something important and remember that anything that is cable (phone, network, internet, etc) have access to outside the building which can conduct electricity and damage anything that is connected at the end if a lighting strike the building. 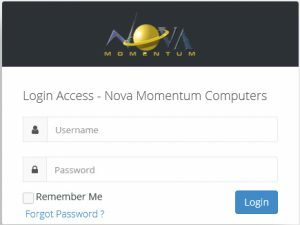 After the storm all the customers will like to be up and running right away, Nova Momentum Computers will try the best to bring everyone up but we ask to be patience.